Avon and Somerset Police has carried out two successful anti-drugs operations in east and central Bristol, as part of its on-going commitment to reduce the harm caused by drugs in these communities. Twelve people were arrested and a man was given a prison sentence after pleading guilty to drugs offences. Last week, Daniel Miller, aged 23 and from Ballard Close, Speedwell, pleaded guilty to possession with intent to supply crack cocaine and heroin. He was arrested on 1 May after officers on patrol in Greenbank spotted a known drug user getting out of a hire car. The car made off from officers before they managed to block it in on Stonebridge Park. The driver – Miller – had 52 wraps of class A drugs down his trousers, along with hundreds of pounds in cash and two mobile phones. A later search of his home led to more drugs, cash and phones being seized. He was sentenced to 40 months in prison. A 27-year-old man from Barton Hill was also arrested on suspicion of possession with intent to supply class A drugs, after he was spotted hi apparently selling items to a known drug user on Unity Street in St Philips. This man was also in possession of a number of wraps of suspected class A drugs, a large amount of cash and a phone. He has also been released under investigation. Later that day police arrested a 35-year-old man from Fishponds and a 20-year-old man from Kingswood on suspicion of possession with intent to supply class A drugs, after officers spotted a car acting suspiciously in the Easton area. 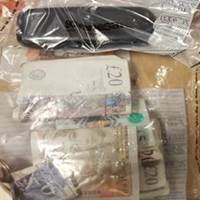 Police stopped the vehicle and searched the occupants who were in possession of a quantity of suspected Class A drugs, large amounts of cash and multiple mobile phones. The men have been released under investigation. Arrests were also made at Castle Park, in the Galleries and on Beaufort Street. On 24 May police ran another day of action targeting people dealing drugs in east Bristol. A 27-year-old man from St Pauls was arrested in Tower Hill St Philips as he was wanted on a warrant for failing to attend a court trial for drugs offences. He was remanded in custody and appeared in court the next morning. Clay James, aged 22 from Barton Hill, was arrested after a short pursuit of him on a moped by officers which ended at Temple Meads. He has been charged with dangerous driving, failing to stop for police and for driving without insurance. There were also arrests on Backfields Lane and at the Lawrence Hill roundabout – police have not said that any of the arrests over the two days are connected. Easton Neighbourhood Sergeant Chris Green said: “The number of arrests made last week and the subsequent charges show that we are determined to fulfil our promise made to the communities of Easton and St Pauls that we will not let people get away with openly dealing drugs in their streets." “We rely on the support of the community to make these operations work – please tell us what you know, so that we can continue to target the people bringing crime and misery to local areas. To report a crime anonymously, contact Crimestoppers on 0800 555 111. They never ask for your name or trace your call and offer up to £1,000 in reward for information which leads to an arrest and charge.